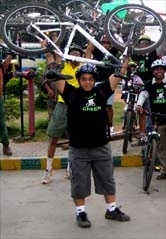 14 June 09 Go Green Ride (Campaign Ride towards Lalbagh) - GGI-Group size: 4000+ Professionals, Increasing on day to day basis, Come & join us 2 serve Mother Nature. 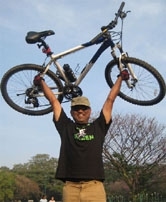 Route : Coffe Day /Apple Mac showrrom Jnagar 5th Blk- Jaynagar 4th Blk- 3rd Blk - Ashoka Pillar - Lalbagh rear gate - Lalbagh Main Gate - Lalbagh West gate - Bangalore Hospital - Jaynagar 3rd Blk-Jnagar-4th Blk - Coffe Day . Prabhakar Rao, Pranalini,Nalina P Rao,Pavithra,RajaRam,Mahesha,Sameer,Timmana Bhat & Chidanand. 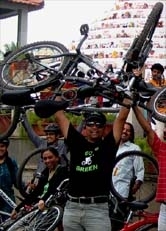 14Jun09 Go Green Campaign Ride.